the human-computer gap. There are various articles we have published on Schema.org, Semantic web along with the practical implementation specifically in self hosted WordPress. However, this article is more on the core of Schema.org. I personally think, implementing Schema.org by all the search engines is very important because to filter out the half-literate spammers and made-for-AdSense website owners. This bulk not only unhelpful for the users and good writers but also for the search Engines. The amount of Big Data will increase day by day and good websites are getting buried because of the well known on-page gray to black hat tricks implemented by the webmasters. Optimizing onpage with keywords is actually a pain and makes the topic bad both while writing and reading. You will see that, YouTube’s videos get more easily a good rank – the reason is, the chance to do any blackhat is not present and Google fully uses the Schema.org markups to understand who actually has uploaded the video. You can see a term – honorificPrefix. That honorificPrefix is Dr. for me. It fixes the issue of the “Split Personality” – Dr. Abhishek Ghosh and Abhishek Ghosh. 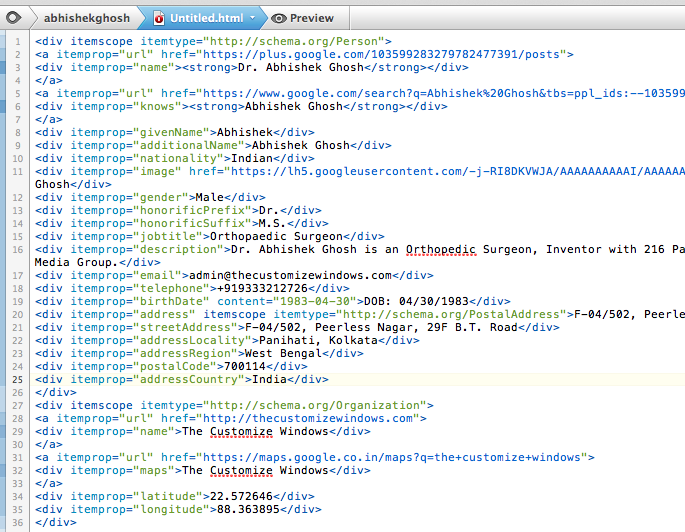 Abhishek Ghosh uses the honorificPrefix Dr. So if links are coming from the same webpages bidirectionally, the person is same. 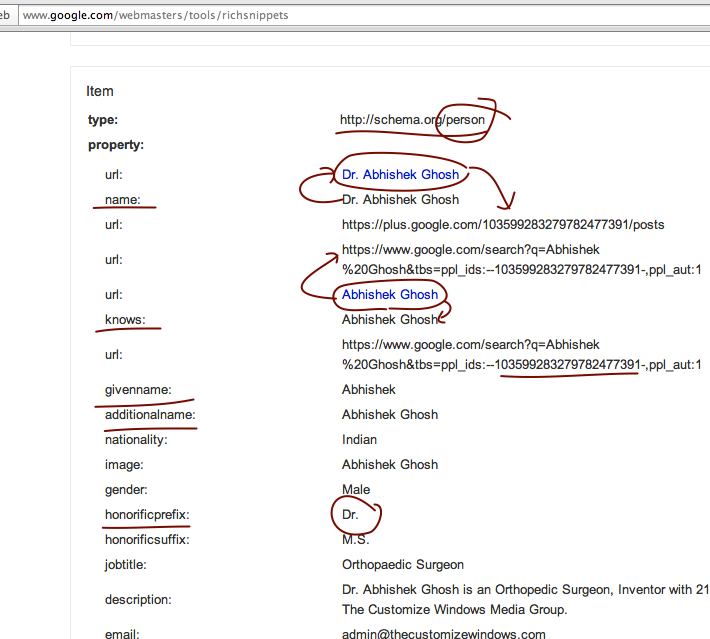 Now with the mixed old and transition to new Schema it is some what closer like if you search with “Abhishek Ghosh Cloud” in Google Web Search. You visually can see the data, right ? That is what we need. Think more complex things – the Patents are registered as G. Abhishek, Dr. as the inventor. Its practically impossible to understand even by my mother that, it is my name. So gradually, we can unify a human with his/her shared knowledge. Inside one mother DIV, for example – Webpage; will be Article (for example) with closed DIV, then another DIV like for Person and finally the mother DIV should be closed. I have used DIV in all caps to emphasize the importance. All WordPress Plugin fails to pass this practical part. Its easier to write in HTML format but difficult for WordPress – you have to customize the theme itself. span can be used as tags but better to avoid for making it more complex to understand by you. Do not use Raven’s automated Schema Creator, it has many flaws. Hand code yourself and test with Google’s tool. Now, we can add more complex data to describe, for example – about a book on Knee Arthroscopy. It is definitely a product to sell but not a product like a WSO handbook. This Article Has Been Shared 4390 Times! 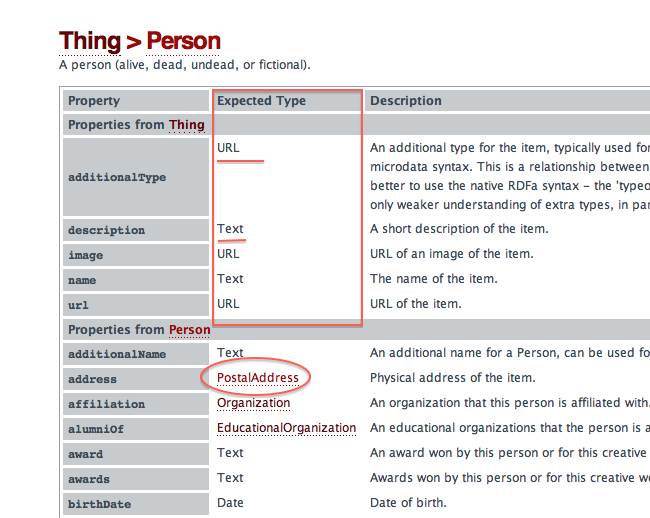 Adapting The Standards of Semantic Web For Our Website Has Been Possible Because of Genesis 2.0 Beta. Thanks to Bryan and his Team for Excellent Coding. XenForo Usage Guide and Advanced Tips is helpful for the basic users as well as the users who want to use XenForo Addons and do Template Modifications. Cite this article as: Abhishek Ghosh, "Schema.org : Schemas for Structured Data Markup," in The Customize Windows, May 2, 2013, April 23, 2019, https://thecustomizewindows.com/2013/05/schema-org-schemas-for-structured-data-markup/.